Not only did Pedro bring a couple of Irnbrus to our last blog meeting (excuse to go to a pub), he also brought this interview with Hector Bizerk. Who knew Shambles Miller was this influential. Hip Hop (along with Jazz, Blues, Cheeseburgers, and Football) is something that fills me with great American pride. You seem to have a deep appreciation (from the graf writing reference on the Living With Rhyme EP cover art to youtube posts of the “golden years”, ie; Souls of Mischief) for the roots of our great homegrown musical export from the Bronx. What records influenced you along the way? ” I think without doubt America’s greatest export is hip-hop culture! Maybe I’m biased in that respect. I value the importance of Graf as a means of social expression, I’ve never done any major pieces myself, but I enjoy seeing European cities covered in colour and tags n murals. It really gives you an idea of what the people of the city really think when you see the vibrancy in some of the graff in Paris or Barcelona, for example. In Barca they have the whole Catalunian expression of identity and it works really well in a hip-hop sense. You can see the oppression being detailed. In Ireland too…there are walls full of political tags and cultured murals. Graf gives a great sense of identity and understanding. Glasgow has some tight crews…Easy Riders are the most notorious. You should check Akme’s work! I’ve seen hip hop live throughout the years and the sonic impact was more prevalent with live instrumentation in the mix (NaS & Damian Marley, Digable Planets to name a recent and an old gig). Though, I have a feeling that the lack of live musicians for the Watch The Throne tour is fitting and essential in presenting Hip Hop minimal and pure, kind of like you do. Was the idea of having a live drummer born out of necessity? Are you planning on experimenting with more sounds/instrumentation for future recordings and/or live shows? You’ve played on some interesting bills. Who is someone you would like to support/collaborate with? You mentioned that Scotland’s Hip Hop scene goes back to the ’80s. Name some mcs that a newbie (like me) should check out to put together a mixtape of the evolution of Scottish Rap. Shambles Miller recommened you in a recent interview. Have you seen his acoustic cover of “99 problems”? …Seems like a silly, fun loving guy. A quick glance at Glasgow’s varying “genres” and aesthetic styles in music paints a broad but singular Scottish take on rock and roll music. Is there a fair amount of support, inspiration, and collaboration between you all? Or are music and scenes sadly compartmentalized? Are there any Scottish bands you recommend we give a listen? “I haven’t heard Shambles version of that but I know he’s a talented geezer. Is there a story behind the name, Hector Bizerk? Who did the Hector Bizerk “logo” artwork and how do I get a t-shirt so I can spread the good word in San Francisco? When Pedro first mentioned wanting to feature H.B., I gave a quick listen to the first EP on bandcamp. To be honest, I thought it was merely ‘allright’. Going back last night, I found the new EP ‘Living Off Rhyme’ and was thoroughly impressed on how much more open and daring it seemed to me. I don’t know the first thing about the genre, but I know what I like. The opening track ‘Tsunami’ is brilliant as is the last song ‘Train of Thought”. Not surprisingly, it is as poetic as Kevin Gilday. The three tracks in between are a good ride as well. The strength and effectiveness of the drumming really shines through on this. What I am starting to love most about the blog is how it is gradually expanding my musical horizons as I continue to explore the best Scotland has to offer. 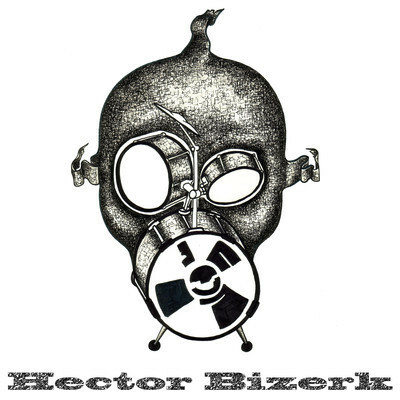 This entry was posted in Bands We've Chatted With and tagged Hector Bizerk.